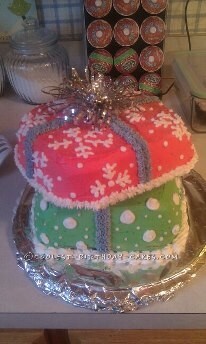 I decided to make this Christmas gift box cake for my office Christmas party the first year I worked there. It’s super easy! Just make two square cakes. Wait for them to cool. Stack them on top of each other and frost a base layer of white on them. I found some Christmas wrapping paper as inspiration and decorated them as gifts. My co-workers loved the cakes! They had no idea that you could be so creative with holiday desserts. They really liked the real bow on top of the cake (the tinsel is really easy to put under water to make sure it’s clean! ).